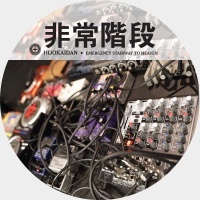 Although their label discography is peppered with releases from Japanese outfits, Emergency Stairway To Heaven marks the first release on Cold Spring from Hijokaidan, one of, if not, the longest running groups in the Japanese noise scene. Active since the late seventies in 2014 they celebrated their long existence with the album Hijokaidan 35th Anniversary Album. In 1993 my travels in the USA coincided with what was billed as the largest concentration of Japanoise to perform in America which meant I caught Japanoise heavyweights Hijokaidan, Masonna and Solmania in Los Angeles. I haven't heard Hijokaidan in a long time but this attractive picture disc captures a studio take of Hijokaidan's improvised noise, from a quartet featuring Hijokaidan stalwarts JOJO Hiroshige and Toshiji Mikawa (also of Incapacitants) and the later additions of Junko and Futoshi Okano to the Hijokaidan ranks. Emergency Stairway To Heaven is something of a blast but it takes a while to get the full-on onslaught from these noise veterans. The opening tracks could be considered misleading as they kinda tap into noise-rock or a loose noise free jazz thang. The layers of serated noise emanating from Jojo Hiroshige's guitar on 'Emergency Stairway To Heaven Part 1' is accompanied by electronic squall and rumbles, interspersed with squeaks and anchored to a backbone of rhythmic drumming that owes a lot to free jazz time structures. Those squeaks which appear throughout the album are actually the extreme and bizarre language-less vocalisations of Junko, who regularly performs solo and has featured on collaborations with Kylie Minoise and Sutcliffe Jugend. 'Emergency Stairway To Heaven Part 2' is less unrelenting offering a less dense and more atmospheric improvisation with noise rumbles and layered guitar shrieks and effects over cymbal heavy drumming. Here Junko's indistinct wails resemble a children's toy mimicking the sound of muted horns. The whole thing is like a deformed take on free jazz, which breaks down into a hallucinatory freak zone of squeaks, frequencies and arcing drones. It really takes until the short third track, 'Emergency Stairway To Heaven Part 3', before we're hit with something approaching the full-on noise onslaught of Hijokaidan where waves of guitar noise, electronic abuse, hyper drumming pierced with Junko's howl is sucked up into a careering cacophonic pronged attack, resembling a multi-armed Merzbow - that other King of Noise. Energetic, chaotic and psychedelic this represents best the sound of what I think of when I hear the term Japanoise. Side 2 is given over to a lengthy improvised take which extends the sounds from the earlier tracks with more squeaks, skree and squall. Backed by hyper jazz like drums, the elasticated screech of Junko pours over waves of scuttling shrieks of guitar destruction. This extended 27 minute take is part rhythmic noise rock and part free jazz noise. Around the 12 minute mark we're reduced to free-wailing and drumming before it picks up the space age oscillations of droning whoosh. It's worth pointing out that even though the title alludes to Led Zeppelin in their extensive discography Hijokaidan have paid homage to the likes of Hawkwind, Jimi Hendrix and Faust. 'Emergency Stairway To Heaven Part 4' is a blistering freeform assault of shrieks, feedback and drone, probably like nothing you've heard before unless you're attuned to free jazz noise abusers such as Borbetomagus and Ascension. Accompanying the 12-inch picture disc is a CD containing two shows from 2014, with drummer Futoshi Okano absent from the first show in May. Jojo also foregoes the guitar for synthesizer here. The result is noise drone acting as a backdrop to Junko's indeterminate chatterings laced with electronic noise wash. It's an exhilaratingly powerful live performance of unending frequencies and textures. The second show, recorded at Live At Chikusa-Za in December, is immediately more physical and more direct. That's largely due to the full-on pile-driving drumming of Futoshi Okano to which Junko does well to keep up with the muscular pummelling. This show pushes the boundaries with guitar abuse pushed to the max. Intense and surreal Junko's yelp and scream is in a world of its own here, despite the charged yelling from at least one of the blokes. Electronic overload, maximum guitar abuse, free- jazz drumming and vocal screech this is a more chaotic form of noise more typical of Japanoise.